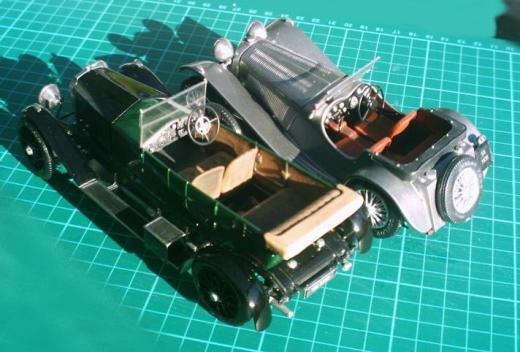 The restoration of plastic model cars. 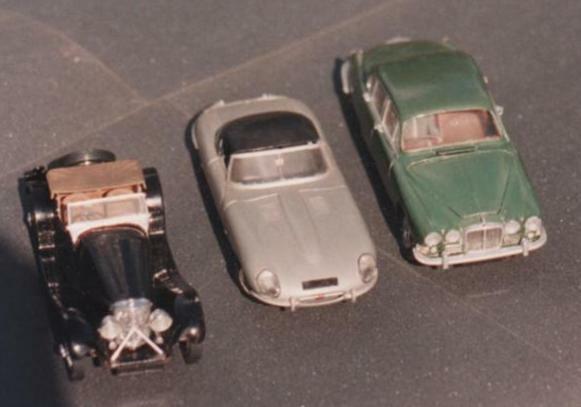 This is not a detailed account of each models restoration, but a collection of observations which are of assistance to anyone contemplating restoring an old model. We will follow this article with to examples of cars that have been restored to give a practicle demonstration of the methods outlined below. Just mentioning the word ‘restoration’ is usually sufficient to start a discussion as to should cars, never mind models, be restored to the standard as originally made or should they be re-built utilising the benefit of to-days advanced materials and methods. Rod likes to keep his older models as they were built, in all their 1960’s ‘Glory’ as period pieces, not that at times think he doesn't think he could do better with that same kit now! Some of his earlier Airfix 1/32 models, through age, where in need of attention. The tube cement used when the Sunbeam Rapier was built had crystallised and it fell apart while cleaning as did the Matchbox SS100 Jaguar! When a IPMS club member found an Airfix model of the Austin Maxi that he had made in his youth and no longer wanted, he offered it to Rod, so here was his chance to see if he really could do any better with these old kits! If by any chance you still have, or can borrow the instruction sheet, this will prove invaluable as an aid when dismantling and checking if parts are missing. You will need your usual modelling tools, a plastic bag that has no holes in it, or an airtight container, and which is of sufficient size to hold the components of the model when stripped down. Two small containers with lids, one to use as a cleaned parts box and the other for washing parts in, a fine mesh strainer, a washing-up bowl, spray on oven cleaner, and a small firm bristle or similar paint brush to wash off loose paint. One useful item that may not be in your tool kit is a set of very thin ‘Airwaves’ photo-etch saw blades that fit a Swan-Morton scalpel handle. Being very thin they can get between parts, but they do bend easily so grip them where they fit into the handle. All the cars below have been through this restoration process. whether through accidents, or simply aging, when things fell apart the oppertunity was taken to bring them up to date. Other pictures of these cars can be found within the museum. A 1930 Ford Model A built from a Monogram kit. The model was restored and is seen here with a scratch built folded hood. A restored model Mercedes 540K from the original Monogram kit. This kit was later re-issued by Revell. Three Airfix models that have benefitted from modern technologies and techniques. Models that have been brush painted with enamels often appear to us now as if the paint was ladled on rather than brushed and this may be hiding the joints between parts. The old ‘tube cement’ can make it very difficult to separate the parts, so remove and dismantle only those parts and components that are inclined to readily come away. Remove the body from the chassis and concentrate on removing complete units, e.g. engine, seats, front and rear axle assemblies, exhaust unit, bumpers, etc. Leave items like door handles, windscreen wipers, lamp lenses, etc. in place until later. I can’t emphasise enough that if it does not want to move LEAVE IT ALONE! At this stage it is better to leave it alone and wait until the paint is removed and you have a clear view of the parts and joints. 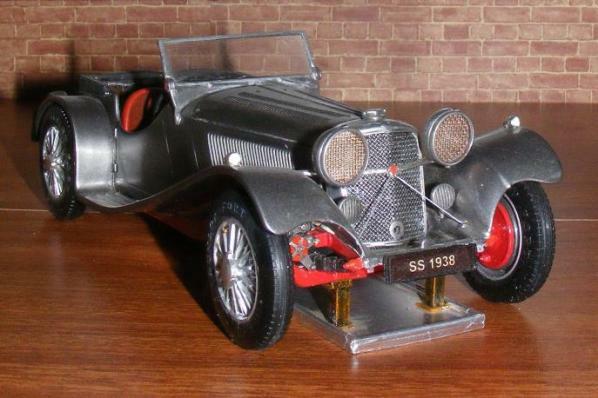 Two models by Wills Finecast, the SS 100 and Vauxhall 30/98. Both models were purchased ready built and were stripped back to bare metal and rebuilt. A lot of White metal kits are heavy and it is common for the axels to bend over time causing the wheels to fold in at alarming angles. Our tip is make up a drip tray and axel stands, a novel and not unrealistic way to take the weight of the model and avoid that axel bend occurring. This one was scratch built by Rod. 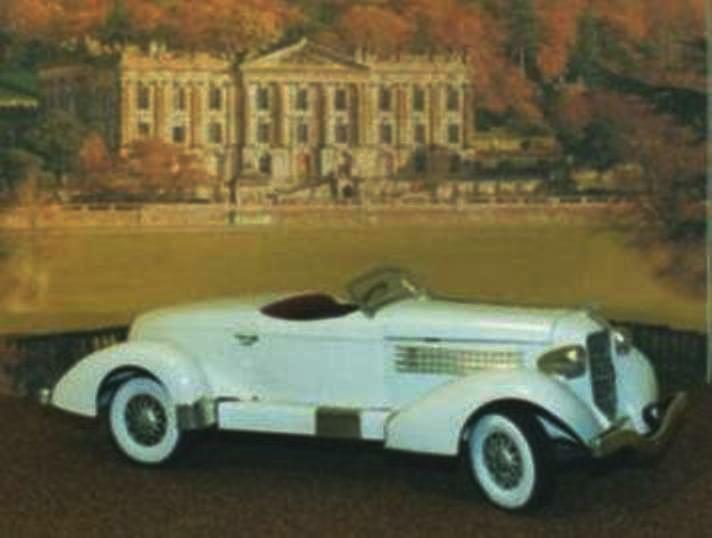 Jaguar SS100 Finecast kit Renovated in 2004. This is the easy bit. If you have not got the instruction sheet make a list of the parts you have removed, and of other parts still attached e.g. 4 front lamp lenses, filler cap, gear shift lever, hand brake lever, etc., this will prove useful later when it comes to washing the parts. Place all the parts in a plastic bag and add the oven cleaner. For a 1/32 scale kit I use 1 - 2 teaspoons of oven cleaner. Remove as much air from the bag as you can and seal the bag by rolling the top over and fix it with a peg. Gently turn the bag over in your hands to circulate the cleaner over the contents inside. You don’t have to coat every part of the model as apparently it is the fumes that do the work, and these will loosen not only the paint but also soften the old cement, making further dismantling easier. Leave for 24 hours. WARNING. Oven cleaner removes the chrome plating from plated parts too, so if you want to retain the plated parts do not include them in the paint stripper process. (But it is useful if you want to remove mould lines or sink marks from plated parts and then re-chrome them). Incidentally, Rod found while restoring a metal kit that had been assembled with ‘Aroldite’ that oven cleaner also reduces this adhesive to a rubbery state and makes dismantling easier. Take away containers can also be useful for the process of paint stripping, they are air tight so contain the fumes and keep the parts safe. The fumes can be very potent so avoid breathing them in. I always do the opening outside to aid ventilation! Unseal the bag, or tub, pour in warm water sufficient to cover the parts and swill it around in the bag. The water will become very ‘sludgy’ with old paint. If you have sensitive skin wear protective gloves and remove by hand the larger parts and any you can see or feel, place them in the ‘cleaned parts box’ and check them off on your list or instruction sheet. Now empty the bag VERY SLOWLY AND CAREFULLY through a fine mesh sieve into the plastic dish. Empty the dish through the sieve into the washing up bowl, check for and place in the parts box any parts you find. Repeat this until the bag is empty. Pour away the water in the bowl through the sieve. Check for parts as you pour and in the bottom of the bowl. We can’t emphasise enough the VERY SLOWLY AND CAREFULLY warning. It is very easy to miss a 1/32 scale door handle or lamp lens! Loose paint remaining on the model parts can now be brushed off and the parts left to dry. It is sometimes necessary to repeat the ‘Oven Cleaner’ and washing process several times. 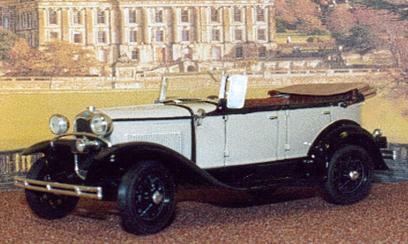 The renovated Vauxhall 30-98 finecast kit mentioned above. It also has a drip tray and axel stands. Standing beside the 30-98 is another Vauxhall, a scratch built 1905 Vauxhall 5-9hp. You should now have a fairly clean collection of parts to work with. Most of the parts will separate with astute and careful use of a knife blade. DO NOT use a scalpel as these blades are not made to withstand lateral pressures and will break sending very dangerous fragments flying off at great speed and force. Take a good look at parts before you remove them and if you don’t have the instruction sheet make a sketch or note of their position e.g. which surface faces front or nearside, bevel face to top etc. As you remove parts look for dowel holes and location pegs. You can even take a few photo’s if you have a digital camera handy. In a lot of instances as you remove parts some pegs will break and leave a blocked dowel hole. If this happens immediately drill out the hole and sand down the remains of any peg as well, drill the part and add a new peg too. Do this now as you may have difficulty finding these locations when parts have been cleaned and sanded down. 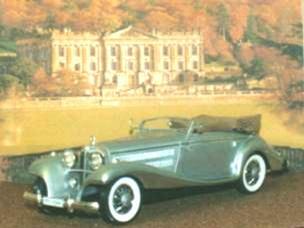 Restored in 1998, a Monogram kit model of the Auburn Speedster originally built in the 1960’s. ‘Bare Metal Foil used for all chrome parts. We have found wooden cocktail sticks to be safe and useful for prising and levering off parts, as the stick will usually break before a plastic part will. These sticks can also be used to safely ‘push through’ from the back items attached with peg and dowel mountings e.g. some lamp lenses, bumpers, gear levers, road springs, shock absorbers etc, Particularly stubborn pegs can sometimes be persuaded to ‘give’ by very careful drilling down their centres with a finger drill to obtain a ‘start’. Blobs of old cement can be carefully removed with a ‘craft’ power tool and burrs. Wheels pose several problems, mainly in removal of hub caps, and freeing wheels from the stub axles. Prising off hub caps can result in chipped edges and/or a broken stub axle, so if you really need to remove the hub caps, perhaps to chrome with foil, it may be advisable to cut through the stub axle and drill out the remains from the wheel, then push the cap off with a wooden stick, but remove the ‘point’ of the stick first, The flattened end of an old thin paint brush handle can be useful for this operation. (For repairs to axles see details later). Clear parts need very careful removal. Make sure you do not bend these excessively in your efforts to remove them or you will induce ‘stress fracture’ lines that cannot be removed. Old cement stains can be removed. Cleaning and replacement is described later. REPAIRS AND PREPARATION FOR ASSEMBLY. You will probably be surprised, as Rod was, at the amount of flash, mould lines and sink marks remaining on parts that was not removed or treated when the model was originally made-up (memories of those glorious old ‘glue it and paint it days’!). He was also surprised at the amount of detail on old Airfix kits; they really were very good when you consider the limited technology available at the time of production. Generally, preparation is the same as for a ‘new kit’, but you may have to drill out broken pegs and holes you missed earlier. Replace broken pegs with small lengths of rod or wire. Cut to length a new stub axle from plastic rod of suitable diameter. Drill down the centre of both the existing axle case/king pin and replacement stub axle. Cut to length a piece or rod or fuse wire and glue into the pre-drilled holes in the axle and stub. The wire is to reinforce the joint. Replacements can be made from a foil milk bottle tops or aluminium food tray. Take an eyelet, such as a shoelace eyelet, place the piece of aluminium over it and burnish it into shape inside the eyelet with something like a paint brush handle with rounded end. Carefully cut the bowl out of the aluminium and secure in place with ‘super glue’. Can be replaced with a knob headed pin, or by forming a tiny blob of super-glue round the head of a straight pin to form the knob then cutting the pin to the length required. Fuse wire can also be used forming the knob in the same way. Can be replaced with new scratch built handles, see Fig.1. Usually there is a dowel peg hole in the body to accept the handle (A), drill this to accept a plastic rod the same diameter as the missing handles lock barrel, from this rod cut a length sufficient to serve as a combined barrel and fixing peg. Select a plastic tube that has about the same circumferential curve as the door handles (B). Cut a slice off the tube, giving you a ring about as thick as the required handle. Now cut a section from the ring of the same length as the required handle (C). Cement one end to the lock barrel/fixing peg and when dry sand to shape to match the existing handles (D). A similar operation can be used for T-bar type boot and bonnet hood handles. For door or wing mounted mirrors punch out a disc of plasticard and cement in place as a mounting plate in the desired mirror position and then rub down to contour the edges into the bodywork. Drill a hole centrally in the disc and through into the bodywork of a diameter to accept a length of 15 or 30 amp. fuse wire (according to scale). Punch out a disc or cut a piece of plasticard to the shape of the mirror. If you have chosen a shaped mirror and intend to fit ‘Mirror Glass’ cut the glass to match now. Secure the ‘Mirror Glass’ and fuse wire arm to the mirror, but do not fit the assembly to the body yet. If you intend to chrome the mirror with ‘Bare Metal Foil’ then place a piece of foil over the mirror mounting plate disc you have attached to the body after you have applied primer to the body. (After the body has been sprayed with the topcoat of paint you can T-cut over the disc to give a chrome mounting plate. (See separate leaflet in this series about using ‘Bare Metal Foil’ for scripts and badges). Glue marks and fine scratches can be removed using very fine ‘wet-and-dry’ and then ‘T-cutting’ and polishing, beware of flexing these parts as you can induce permanent stress lines. The easy way to make a replacement clear part with acetate is to cut a piece larger than the window aperture, check that it does not interfere with any interior features and attach it over the window opening. Alternatively you may prefer to ‘fit’ the acetate into the window opening, this always looks nicer, but if you ‘fit’ one window you may have to ‘fit’ all the others to match! 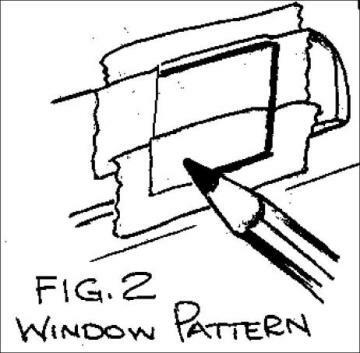 For this method attach a piece of masking tape over the window opening on the ‘in-side’. Then from the ‘in-side’ run a pencil round the edge of the opening, marking the tape on the non-adhesive side, (see Fig.2,) then carefully remove the masking tape. Transfer the tape to your acetate sheet and press down, now cut round the outer edge of the pencil line, that is, cut it oversize. Fit and trim as required to obtain an accurate fit. Watered down ‘Resin-W’, ‘Acrylic Clear Gloss varnish’, jeweller’s glue or any clear finish adhesive used sparingly, is ideal as they dry with a transparent finish. Avoid superglues as these can 'fog up' and spoil all your hard work. Rod prefers not to fit windows and clear parts until after the body has been sprayed with the top coat and lacquered, as this avoids having to mask-up, but if you prefer to fit and mask these parts the choice is yours. He does attach door handles as these can be ‘Bare Metal’ foiled over the top coat, and there is a little extra security added from the paint. Do not fit bumpers. These can be 'foiled' while off the model then fitted before the clear coat is sprayed on. If you can't rescue the kit parts Rod has his own method for making replacements. On a sheet of acetate scribe closely and equally spaced vertical and horizontal lines with the back of a model knife blade or a ‘Bare Metal Foil’ scribing tool. Cut out with a punch to the required size and position in the headlamp with the scribed lines on the inside. For small scale models you can press the lenses to a convex shape with an eyelet punch. Make sure you press them from the scribed side. If you have photo references you can copy the correct lamp glass pattern. Basically this will be as for a new kit. Experience in restoration has led Rod to believe it is advisable, where feasible, to leave bodies un-attached to the chassis as it makes future interior repairs easier. So, if the body clips firmly and securely onto the chassis you might consider leaving it so attached. Alternatively you may find a suitable location to allow you to drill through the chassis or floor pan into the interior tub or rear seat and secure with a small self-tapping screw. This again will be as for a new kit but the following should be taken into consideration. Dependent on the amount of restoration work that has been carried out it may be advisable to prime with Halfords yellow ‘filler primer’. This when ‘wet-&-dried’ will fill any minor imperfections but take care not to obliterate detail you do want. Found in Articles and Projects.